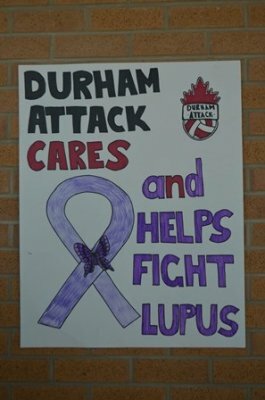 This was a personal choice for our Team to raise awareness of Lupus as our Durham Attack CARES initiative. Our coach’s wife has lupus so it was an easy decision for all of us to choose to support this cause. 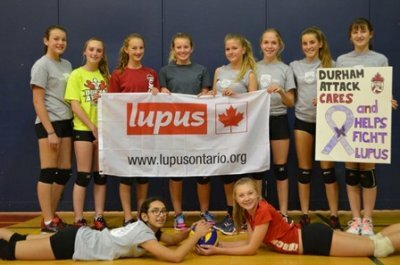 Our Energy team took turns at the Durham Centre, to raise awareness and money to support Lupus research. Before we could begin we needed to ensure that we all understood what Lupus was and learn about how it affects those who live with it. We set up a table (thanks coach Rob aka “Peach”) with information bookmarks and donation boxes in the ready position. At first most of us were surprisingly quiet and shy in asking for donations. As we got into it – we embraced our inner “Energy” and got better at telling people about Lupus and asking for their support. We had chants and cheers and at one point, even a song! It was fun working together and talking to the people who stopped to make donations. It felt great to be able to do something to help a good cause. Such a great feeling of success knowing we were able to help with the fight against Lupus! !